I came into a geoduck windfall the other day. A photo team was in town to shoot some clam digging action, and to supplement the razors and littlenecks we dug at the beach, they picked up a few photogenic 'ducks from the market. By the end of the weekend I was in proud possession of four live geoducks. What to do? If morels were popping (they're not), I'd consider my Sichuan surf 'n' turf, or maybe a ceviche for a sunny Seattle picnic in March (good luck!). So I poked around online. Xinh Dwelley of Xinh's Clam & Oyster House in Shelton, WA, makes a star turn on Dirty Jobs to demonstrate how to prepare Geoduck Sashimi, perhaps my favorite way to enjoy the well-endowed mollusk. Simply adorned with a dipping sauce of one part soy, one part rice vinegar, and a generous pinch of minced ginger, the clam's sweet, slightly metallic taste shines through. Another good source for geoduck inspiration can be found here. Even with various friends on the dole, four 'ducks was just too much clam for three meals. We ended up freezing a couple. 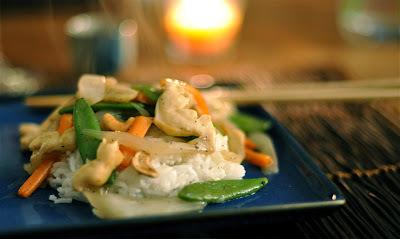 The necks of the other two got eaten as sashimi and the body meat was stir-fried for Geoduck with Snow Peas and Cashews. 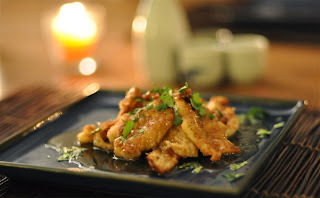 That night we also fried up some razor clams Pan-Asian style with a reduction of sake, aji-mirin, garlic, and ginger. I sure don't mind these clammy days of spring. And I always thought baking was for control freaks. Silly me. 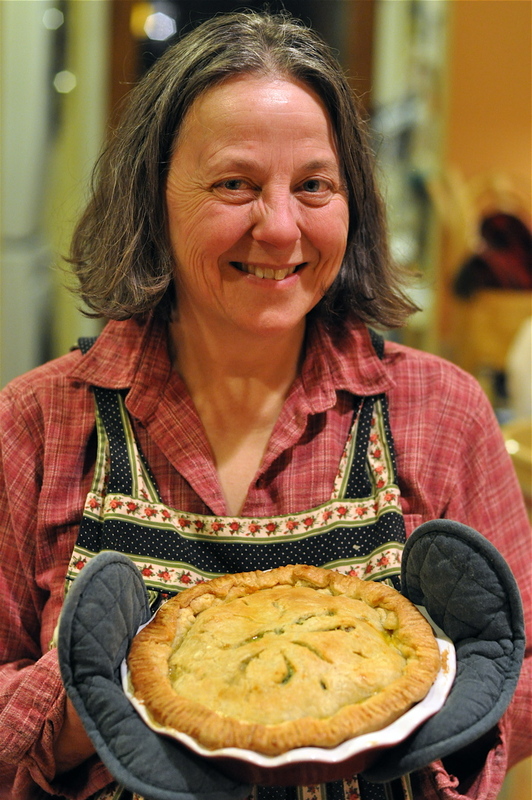 Kate McDermott—aka the Pie Lady, dubbed "the rock star of pie" by Seattle Magazine—is not your typical baker. She doesn't worry about humidity or get hung up by exact measurements. She goes against the grain, which is her way. It's more of a Zen thing. "Feel the dough," she likes to say, only half-kidding. The evening began with a trip out to the chicken coop, where Kate nabbed fresh eggs. Next she unwrapped a tan disc and slapped it on the counter: the dough, just liberated from cold storage. At that moment it could have been dropped at center ice by a man in black and white pinstripes. "Rule number one," she said. "The only rule. Chill out." She handed me a mixing bowl. This, too, was zamboni cold. Of course, like much of what she says, Kate's admonition to chill has multiple meanings. 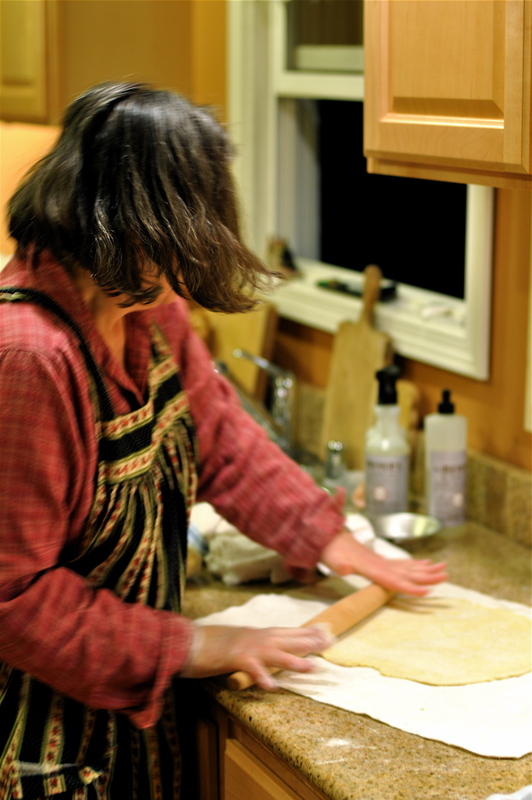 As I started to roll out my hockey puck of dough she stopped me. I was thinking too much. "I'll change the music," she offered. You need the right music to roll by. The smooth vibes of Seal soared out of Kate's kitchen speakers; I remembered how an old three-pinner friend of mine swore by this record for a fresh foot of powder in the back-country. Kate's own style of rolling is more along the lines of the whirling dervish variety. She dances to the music, swings her hair to and fro, and belts out an Aretha Franklin chorus during the next song. This all helps to explain why she calls her business Art of the Pie—as opposed to, say, Science of the Pie. More dionysian than apollonian, Kate's vision is for a world filled with pies, in which pie is merely the starting point for better things to come. "It's a movement," she laughs. Her own part in the movement can be measured by the 50 pounds of leaf lard she goes through each month, the 75 pounds of weekly apples in season, and the hundreds of students who have graduated from her four-hour class with a determination to spread the gospel of pie. 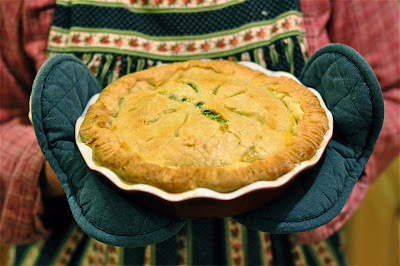 As for me, the proof was, indeed, in the pie, with a crust of flakey perfection and a savory filling that highlighted the brightness of wild weeds. Really, I can't recommend this recipe enough. It's a version of a classic, using stinging nettles instead of spinach, to superior effect. 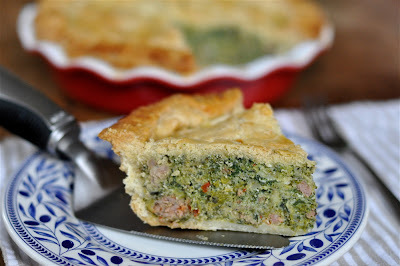 Our tweaks included the addition of leeks, nutmeg, red pepper flakes, and lemon juice. I learned a lot during this pie-making session, and though I won't go so far as to say my new skills are ready for prime time, Kate has put me on the path to a fresh understanding of baking with her pie-making mojo. 1. In a skillet over medium heat, saute sausage, leek, and garlic. 2. Separate one egg and set the yolk aside. In a mixing bowl, beat the egg white and remaining eggs. 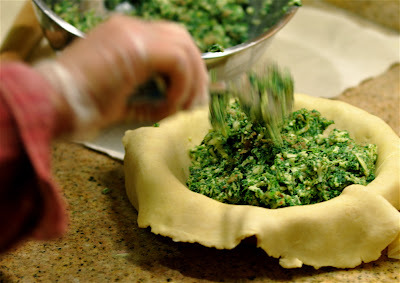 Mix in nettles, mozzarella cheese, ricotta cheese, salt, pepper, nutmeg, red pepper flakes, lemon juice, and sausage mixture. 3. 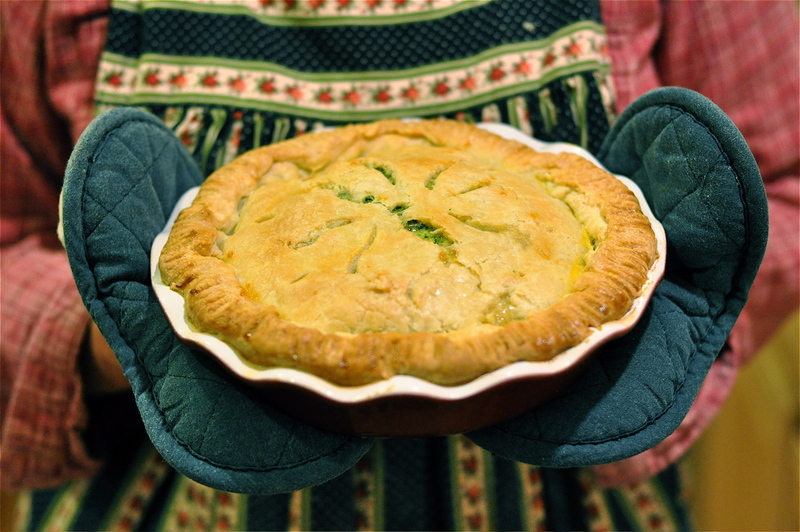 Line a deep 9 or 10-inch pie dish with bottom pastry (with a 9-inch dish you will likely have leftover filling). Add filling. Cover with top pastry. Trim, seal, and flute edges. Cut slits in top. Beat water and remaining egg yolk; brush over top. 4. Bake at 425 degrees for 20 minutes, then lower heat to 400 degrees for another 30 minutes or until crust is golden brown and filling is bubbly. Let stand for 10 minutes before cutting. Sign-up is now open CLOSED for three beginner foraging classes this spring in the Cascade foothills near Seattle. ***Stay tuned for more classes offered in the future. *** Each class will be a three-hour trail walk (2 miles, easy terrain) with an emphasis on identification and food preparation. 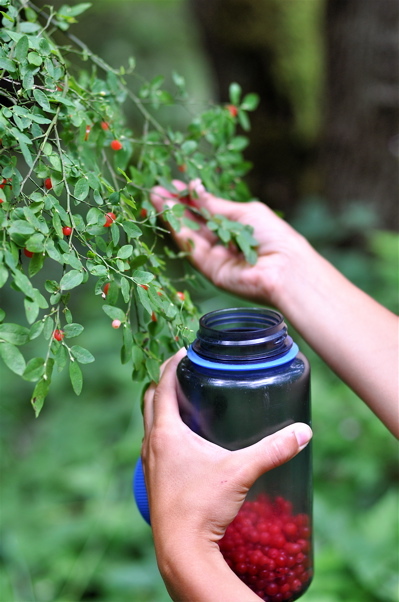 We'll examine dozens of wild plants and fungi that can be used in the kitchen. Trailside discussion will include notes on life cycle, habitat, season, harvesting techniques, processing, cooking, recipes, and putting up. Maximum 12 per class. 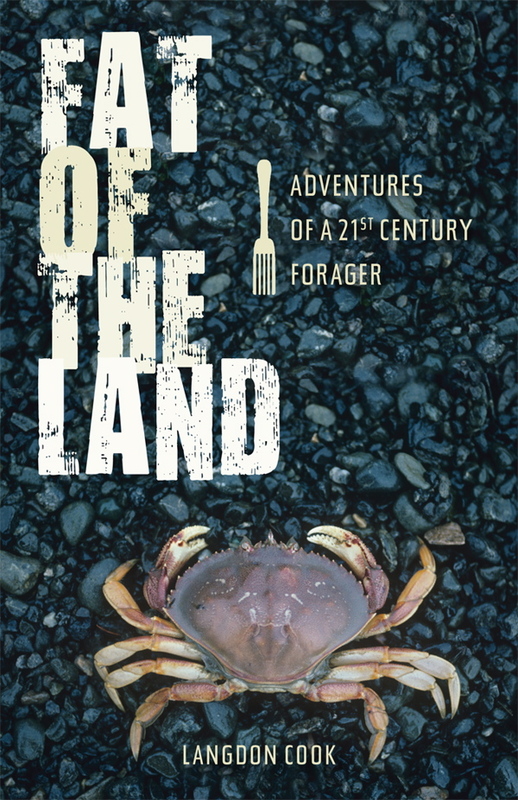 The cost is $35, which includes a copy of my book, Fat of the Land: Adventures of a 21st Century Forager. To sign up or request more information, please email me at: finspotcook AT gmail dot com. Group dates possible. Also, I'll be teaching shellfish and berry-picking workshops sponsored by Bainbridge Island Parks & Recreation. I'm pleased to announce that my book, Fat of the Land: Adventures of a 21st Century Forager, is now out in paperback. 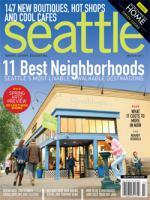 You can buy a copy at all the usual places: Amazon, Powell's, Barnes & Noble, or your local bookstore. Sometimes a kitchen experiment yields better results than you ever imagined, and you feel like Gene Wilder in Young Frankenstein. Happily, my recent creation neither ran amok through the neighborhood nor incited a pitchfork mob—though it did get a wild applause from my dinner guests. I'm talking about my Stinging Nettle Paneer. 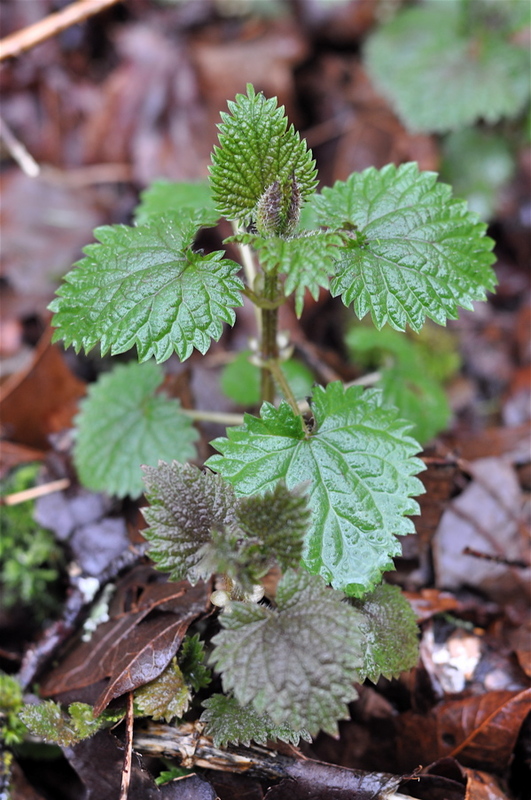 The dreaded stinging nettle, as most of us have known since childhood, is a monstrous weed. It's invasive and hard to eradicate, and woe to those who try to drive it from civilization, because the nasty barbs pack a painful wallop. On the other hand, with a little love and understanding, the nettle becomes an ideal food. 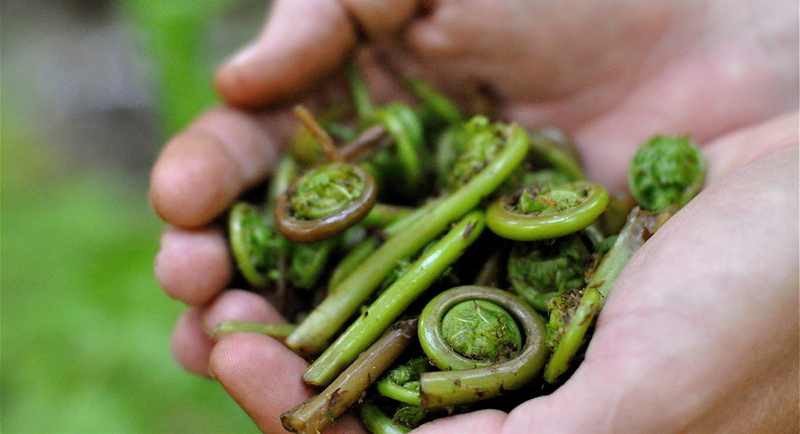 It's one of the first greens of spring (late winter for many of us) and loaded with nutrients. 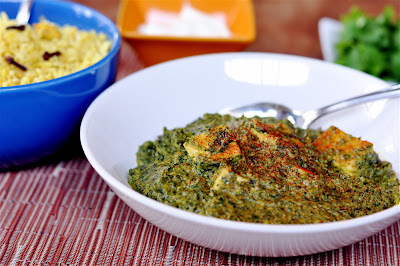 Most people I know who like Indian cuisine have a special place in their hearts for Saag Paneer, the creamy spinach curry with fried cheese. After all, spinach is good for us and even a decadent presentation feels somehow virtuous. 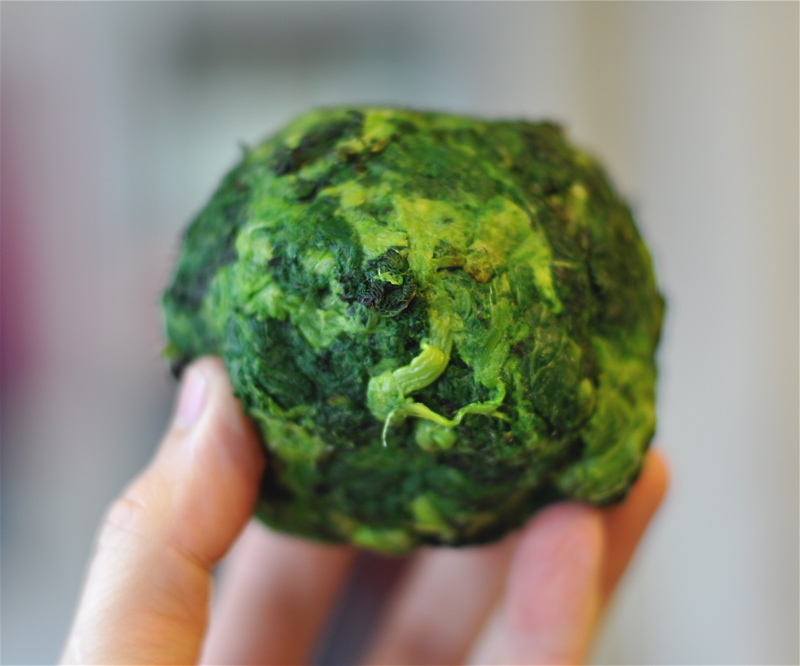 Try this recipe with stinging nettles and you'll simultaneously welcome the weed and never feel quite the same about Saag Paneer again. Substitute stinging nettles for spinach? Really? Believe me, you'll wonder whether this dish was originally invented with the belligerent weed in mind. The nettles leave the spinach in the dust. They're so bright in flavor, with a wild sweetness that goes perfectly with the Indian spices. My dinner guests were blown away and so was I. 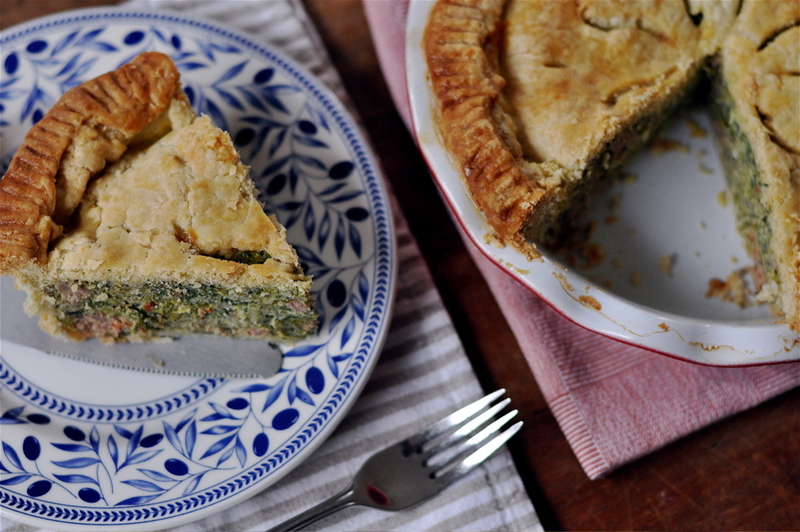 This dish goes to the top of the list of stinging nettle recipes. 1. In a food processor, pulverize the onion, garlic, and ginger into paste. 2. Over medium heat, saute paste in oil for a few minutes in heavy-bottomed saucepan. Add cumin seeds, cardamom, cinnamon, cloves, and tomatoes, and cook for a minute or two, stirring occasionally. 3. Squeeze out excess water in boiled nettles. You'll have a clump about the size of a baseball. Chop up by hand or with a food processor; I like mine well chopped, but not overly pulverized. 4. Add nettles to pan, along with tumeric, cumin, coriander, garam masala, black pepper, and salt. Stir together well. 5. Meanwhile fry paneer cubes in a little oil until lightly browned, then add to nettle mixture just before serving. 6. Finish over low heat with heavy cream or yogurt to desired consistency. Garnish with fresh cilantro. I've been working through my store of frozen wild mushrooms all winter. With spring porcini season around the corner, it seemed like a good time to use up the freezer supply and make room for a new batch. 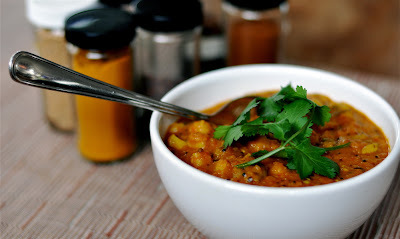 Mushrooms work well in any number of Indian curries; I especially like their addition to this Chana Masala, where they provide an added textural dimension, not to mention mushroomy flavor. For this dish I turned to Michael Natkin's recipe over at Herbivoracious for the spice regime. Toasting your spices in oil is a traditional way to extract full flavor, but you want to be extra careful not to burn the spices. The toasted black mustard seeds, in particular, are a must. 1. With a food processor make a paste with onion, garlic, and ginger. 2. Heat oil over medium heat in a large skillet. Add black mustard, fennel, cumin, and coriander seeds, and toast until mustard seeds start to pop (about 30 seconds or so). Note: do not overcook spices in oil or the curry will be bitter. Immediately add paste and tomatoes. Cook until liquid evaporates and mixture begins to brown. 4. Add turmeric, cinnamon, cloves, cayenne pepper, lemon juice, salt, and a cup or so of water if necessary. 5. Cook uncovered over medium-low heat for 15 minutes. Adjust seasonings. 6. I finished my curry with a tablespoon of brown sugar and a half can (about a cup) of coconut milk, for a slightly sweeter curry. Garnish with fresh cilantro. Cooking Indian at home can seem like a recipe for failure. All those spices! If you're new to Indian cuisine, the first step is to visit your local spice store. You'll want to have the basics: turmeric, cumin seeds, cardamom pods, ground coriander, garam masala, and so on. The amount of spices and seasonings will be overwhelming at first, but a little practice and before long you'll be making your own adjustments to once-obscure seeming spices in a given recipe based on personal preference. In their infinite wisdom—or maybe a moment of deadline and coffee-induced weakness—the editorial folks at Seattle Magazine have handed over a few column inches to this here foraging scribbler. It's called...drumroll..."Cook's Adventures." Every other issue I'll be taking readers on a jaunt to some of my favorite outdoor grocery stores to sample the wild foods therein. For the inaugural column we stay close to home, just sticking a toe in the swirling currents of adventurous gastronomy. "Weed Eater" is a tour of my backyard—and probably yours too. Bottom line: Don't compost those dandelions. Eat them! Yesterday on Seattle's King 5 TV, I spoke with Margaret Larson on New Day Northwest about the new column, taste-tested a few backyard weeds with the studio audience, and cooked up a batch of Stinging Nettle Soup. Coming in May: Morels!